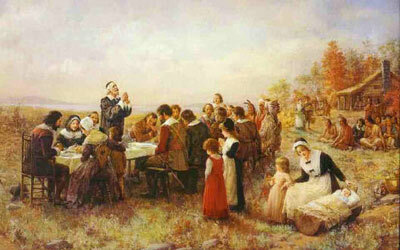 After much trial and tribulation, the pilgrims at Plymouth, Massachusetts in 1621 declared a time of “Thanksgiving” to God who had provided richly for them. This manner of celebrating by giving thanks to God had been a custom in England. The following text comes from original accounts of the young colony’s leaders, Governor William Bradford and Master Edward Winslow, in their own hand. The spelling differences are in the original.